Yesterday, Clif, Liam, and I walked along Brook Trail in the woods behind the high school. 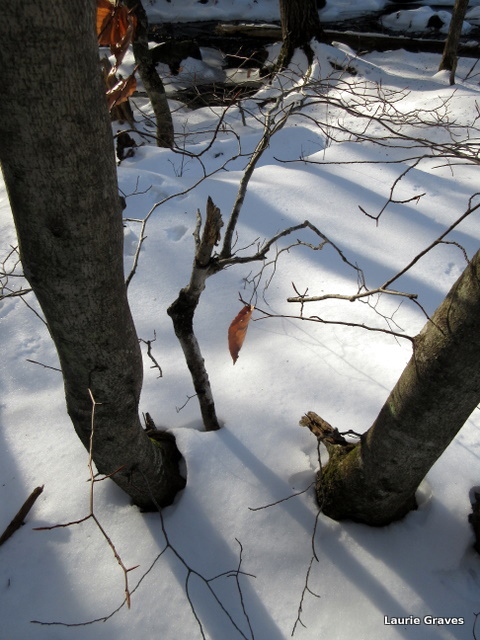 Winter has finally come to Maine, and we have had snow—not so much that we can’t walk in the woods, but enough to make the ground white with blue shadows. In the winter, the woods are so quiet. Gone are the summer songs of the birds, that exuberant burst of life. Instead, there is the crunching of our feet as we walk on the snow. A squirrel scolds us as she rushes up a tree. In the distance, we can hear a woodpecker rat-a-tat-tatting on a tree and the answering rat-a-tat-tat of another woodpecker. I love the woods in winter, the solemn stillness, the muted colors. 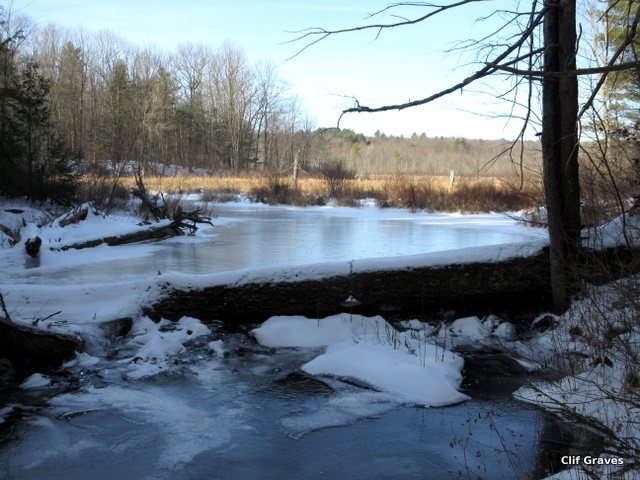 On the trail we take, there is a side path that leads to Brook Trail, and here the quiet of winter is interrupted by running water that now has a skim of ice. We do, too. 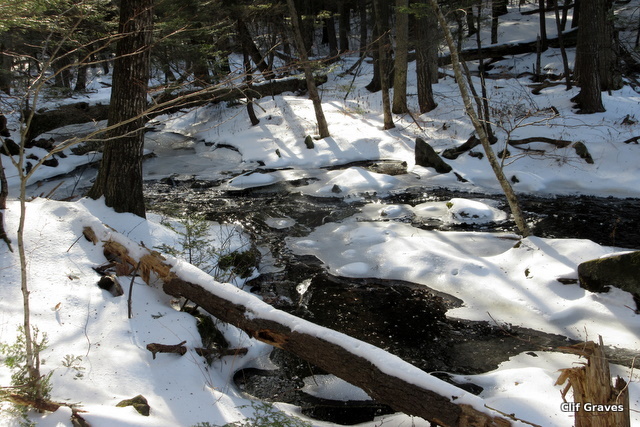 I wonder if the brook will run all winter. 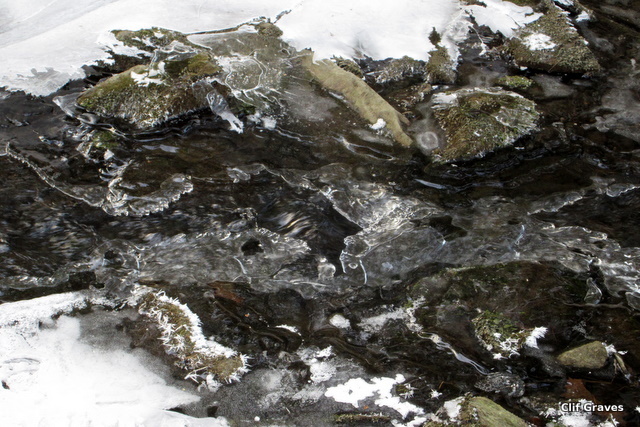 Or, will we get a good cold snap where the brook freezes entirely? Clif and I will be going back today to check on the ice, and we’ll continue do so as long as the snow isn’t too deep. Here are some pictures from yesterday’s walk. Burni, we feel very fortunate to live in such a lovely town. And, yes, there are many delightful spots in Maine. I haven’t been to the river since the snow/sleet/ice storm. The glaze makes the footing too treacherous. Seeing your photos makes me realize how much I miss seeing the daily changes in the ice. Warm temps and rain expected this weekend may change things and open access once again. Fingers crossed! You’ve described a world that is very beautiful but one that I’ve never known or likely to experience; I can’t stand the cold. Sydney is sub tropical but moving closer to being tropical year by year. Mary, that what blogs are for—to show us worlds that we are unlikely to experience. Your photos are as fascinating to me as mine are to you. Lovely. 🙂 Do you think the ice fishermen will have a season this year? Judy, I’m beginning to think that there won’t be much of a season. But who knows? Maybe the cold weather will come. I love the winter woods. I had the most lovely walk in the snow yesterday with big swirling flakes coming down. Rain and strong winds forecasted for today. There goes the snow. Yes, the snow is all gone at the little house in the big woods. Luckily, it’s supposed to snow tomorrow. We had really high winds last night. Lost some roof shingles. Oh, no! Did you lose your power, too? Hope the roof can be easily repaired. 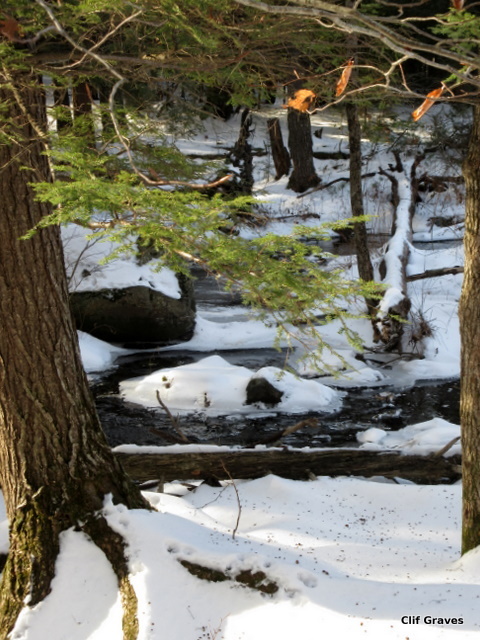 Nothing like a walk in snow-covered woods – so special! Yes, indeed! Unfortunately, the rains came, and the snow is gone. However, it’s supposed to snow tomorrow, and with any luck, the bare ground will be covered.